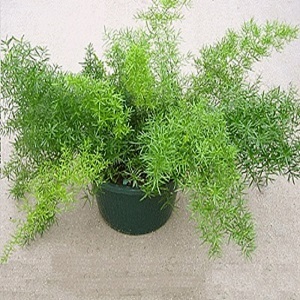 A variety of Asparagus Fern with long, arching stems of feathery needle-like leaves. Plants have white flowers in midsummer, followed by red berries, but plants are largely grown for their attractive foliage. Stems grow to a height of about 90cm, and plants make good ground cover. The fronds are good in flower arrangements. A good coastal plant. The Sprengeri Asparagus Fern grows best and bushiest in bright light and rich well watered soil. It is half hardy and needs to be protected against frosts greater than -4°C to -7°C. It makes an attractive pot/conservatory plant as well as a summer garden plant. Pack of 10 seeds. Sow in spring to autumn. Sowing instructions and a colour photo are printed on the packet. Caution: The berries are mildly toxic. Plants can be invasive if grown outdoors in Mediterranean climates. Conditions Grow in bright light in rich well watered soil. Sow in spring to autumn. 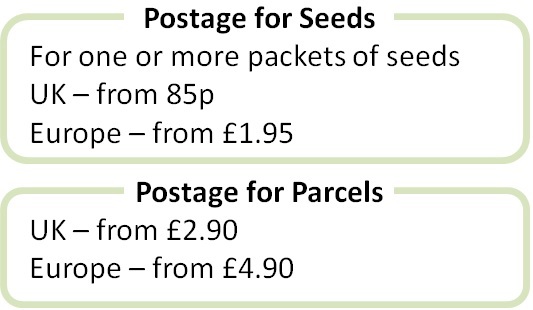 Sow in a deep seed tray or modules of damp seed compost. Keep at 16- 21°C and germination takes 3-4 weeks (sometimes a little longer). Pot on when seedlings are large enough to handle and plant into pots or outside after the last frost. Water well, keep in good light and protect from hard frosts. Trim old stems in spring. Fertilize pot plants every three months.